There is some major excitement brewing in the raw food community these days. You see, there is a global event that is set to take place starting March 1st that will last for 92 days! What's the event, you ask? 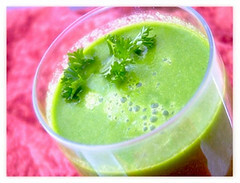 It's the First Annual Global Juice Feast 2008, the largest online gathering of people juicing ever! Will anyone in the Pure Jeevan home be joining the Juice Feast? Well, KDcat is too young to put her body through something like that, especially for 92 days. She's not 100% raw and doing something this drastic isn't something I'd recommend for a young teen who wants to blend in with her peers more than stand out too much. I haven't really talked with Jim about it, so I can't say what he'll think. He actually has the title of Juice Man (one of his many titles) in our home, since whenever we get on a juice kick, he's the one who's doing all of the juicing. As for me, there is a very vague desire to join in on the global thing---you know, to be there with my raw friends experiencing together all of the ups and downs that come with juice feasting.But, that's a very small desire. My goal this year is to stay raw, but transition to lower fat. Sure, the juice feasting will be low fat (more like no fat, most likely! ), but that's a bit drastic for me to jump into at this point. There is a lot of detoxing that takes place on a juice feast. I have to admit I don't think I'm ready to let the flood gates open up with the emotional detoxing I know I haven't even begun to experience. I guess what I'm saying is that I'm afraid to see what sort of detoxing I still have ahead of me---and juice feasting, without a doubt, would bring it about very quickly. Does that mean I don't think the Global Juice Feasting is a good idea? No, way! I think it's a fabulous idea! I recommend it to anyone who's brave enough to dive into it and face, once and for all, their darkest demons. There are tremendous healing stories about people who have gone through a juice feast. I think if you are interested, or even just curious about it, you should check out the Global Juice Feast community that has been created by David and Katrina Rainoshek of juicefeasting.com. I think I am going to juice feast starting March 1! Dave, too! I tried to call you last night about it before I even saw your blog...guess we picked up the same wavelength. Will you be juice feasting at all? I told Jim I thought maybe you'd be juice feasting!! That's great that Dave is doing it along with you. Jim said he's support me if I wanted to do it, but he's not going to do it. I haven't decided, yet. I keep thinking about it more and more---but if I do it, I want to do it for the right reasons (not because everyone else is doing it, you know ).